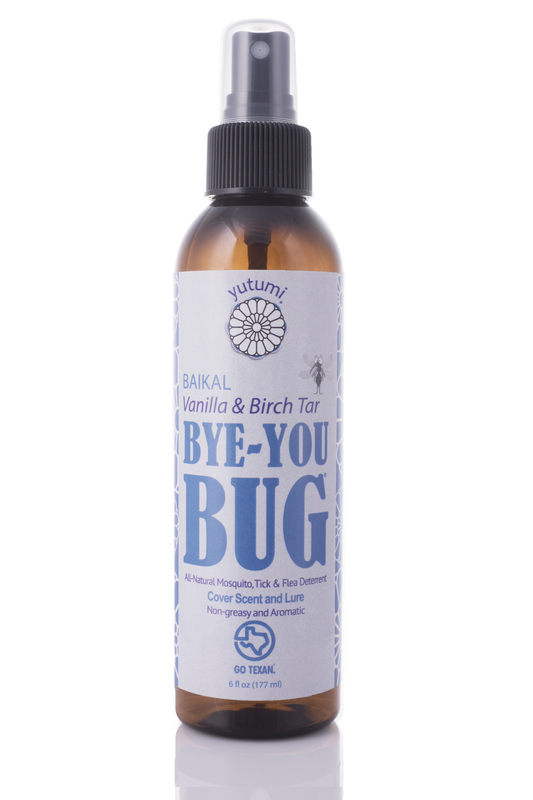 Bye-You Bug® is an all-natural mosquito deterrent and cover scent that is non-greasy and aromatic. Our formula is biodegradable and safe for everyone including expecting mothers, children, and pets. We are pioneering the use of natural food and plant-based ingredients to improve the palatability of mosquito deterrents while leaving your skin smooth and dry. Scientific testing has shown our product works to protect the skin against mosquitoes, ticks, fleas, and other biting bugs, including chiggers, gnats, midges, and no-see-ums. Bye-You Bug® is an EPA 25(b) product exempt from registration with the United States Environmental Protection Agency (EPA) under FIFRA regulations. Please review our label in the link below for a complete list of EPA 25(b) active ingredients and all other ingredients. All of our formulas contain the same active and inactive ingredients. Each formula varies by a single scent which consists of either natural essential oils or extracts. CLICK HERE & VIEW OUR BROCHURE! Bye-You Bug® is continuing to research vanilla extract with the USDA-ARS and Harris County Mosquito Control. Our goal is to provide enough data to register our product with the EPA as a biopesticide. Since EPA 25(b) products are exempt from review, efficacy testing is not required. However, we are actively and willingly testing all of our products for the maximum efficacy and duration while maintaining a balance of smell and feel. Once we have provided sufficient data, we can register our product to prove that natural repellents can be effective. One of our advisors is a board-certified toxicologist with Integrative Biostrategies, LLC possessing over 25 years of experience in product safety assessment. Thus, our products have been developed to ensure that all ingredients are safe for use as directed. — Dr. Laura Plunkett, Ph.D.
Dr. Laura Plunkett, Ph.D., DABT is a pharmacologist and board-certified toxicologist who is a co-owner of Yutumi and an advisor for all Bye-You Bug® products. Dr. Plunkett has experience with EPA regulation of pesticides as well as the human health and safety issues related to use of mosquito repellents specifically. Part of the work she has done with Yutumi includes the design and analysis of testing data on mosquito repellent active ingredients. She has also assisted in the selection of ingredients for our products. No landings and no bites using our "Lone Star" BYE-YOU BUG! Mechanically, all bug sprays inherently work the same way. Whether the repellent is synthetic or natural, they all create a barrier on your skin or clothing that masks our natural chemical excretions that are sensed by the mosquito’s olfactory receptors. These chemical triggers include Carbon Dioxide, Lactic Acid, and Ammonia. Only the female mosquitoes draw our blood in order to successfully produce her eggs. Male mosquitoes feed on plant nectars, but can still probe our skin. Ultimately, the more one covers their skin with clothing and/or repellent, the more successful they will be in preventing mosquito bites. The issue with all repellents is not necessarily their efficacy, but rather their reapplication. We often find that bug sprays, both synthetic and natural, are not applied as evenly and as often as they should. OUR FIRST PUBLICATION FROM THE USDA FOR BOTH MOSQUITOES AND TICKS IS COMING SOON! to learn more about the testing devices and procedures that we are using, please visit our Repellent Facts page! A controlled laboratory study conducted by Integrative Biostrategies, LLC was performed in to examine the mosquito repellency of Bye-You Bug® in a model that is used by companies that develop products as bug repellents. In the test, a speciemen was sprayed with Bye-You Bug® and the product was gently rubbed into the entire specimen. Another specimen served as an untreated control and was not sprayed. Each specimen was placed into a container with 100 female mosquitoes and during a 10 minute period, counts were recorded of the number of landings and the number of mosquitoes that took a blood meal after landing. Results showed that as compared to the untreated control specimen, the specimen sprayed with Bye-You Bug® had half the number of landings and one quarter of the number of blood meals taken. This data indicated that Bye-You Bug® had activity to repel mosquitoes and to discourage the mosquitos that did land to not bite.